The Pentax 15-45mm f2.8 Q 06 Lens is a Q-mount lens with a compact, lightweight design to compliment the pocket-size Q-series cameras. 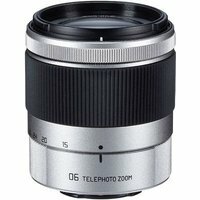 This telephoto lens covers focal lengths between 83mm and 249mm (in 35mm format) and a maximum aperture of F2.8 throughout its entire zoom range. Its large F2.8 maximum aperture means you are able to capture beautiful bokeh (out of focus) effect and use faster shutter speeds to reduce camera shake when shooting in dimly lit environments. This zoom lens includes two ED (Extra-low dispersion) glass elements and one super-low dispersion glass element to reduce chromatic aberration. Measuring 56mm in length, 50mm in diameter and weighing a mere 90 grams, this compact zoom lens is designed to be extremely portable and cover a wide range of topics, from landscapes to portraits.